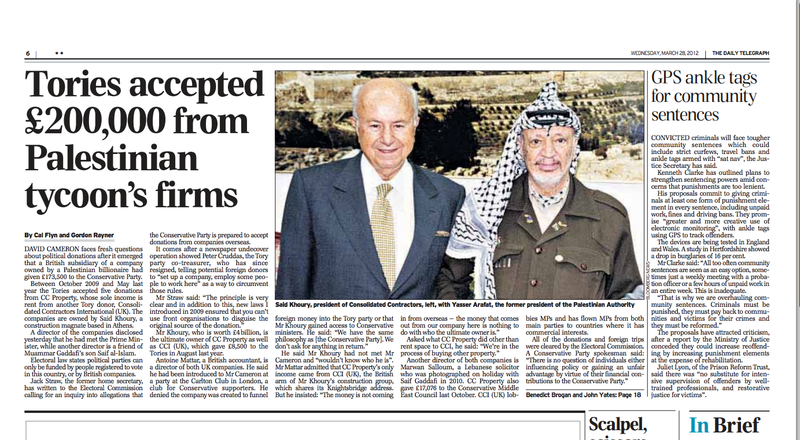 I wrote this page lead article for the Daily Telegraph about a number of major donations to the Conservative Party made by a company owned by a Palestinian billionaire. These donations are particularly relevant following the ‘cash for access’ scandal, when Sunday Times undercover reporters filmed the former Tory party treasurer Peter Cruddas boasting that he could provide access to the prime minister and influence over policy for “premier league” donors. British political parties can only be funded by people registered to vote in this country, or by British companies. Jack Straw has since called for an investigation into foreign donations, telling the Today programme: “The law is in principle very clear, which is that only donations that come from individuals who are on the UK electoral roll or from companies that are registered in the UK are allowed. David Cameron faced fresh questions about political donations last night after it emerged that a British subsidiary of a company owned by a Palestinian billionaire had given £173,500 to the Conservative Party. Between Oct 2009 and May last year the Tories accepted five separate donations from CC Property, whose sole income is from rent paid to it by another Tory donor, Consolidated Contractors International (UK). Both companies are owned by Said Khoury, a construction magnate based in Athens. A director of the companies disclosed yesterday that he had met David Cameron, while another director is a close friend of Colonel Muammar Gaddafi’s son and one-time heir Saif al-Islam. Electoral law states that political parties can only be funded by people registered to vote in this country, or by British companies. Jack Straw, the former home secretary, has written to the Electoral Commission calling for an investigation into allegations that the Conservative Party is prepared to accept donations from companies based overseas. It comes after a newspaper sting at the weekend showed Peter Cruddas, the Tory party co-treasurer, who has since resigned, encouraging potential foreign donors to “set up a company, employ some people to work here” as a way to circumvent those rules. Mr Khoury, who is worth an estimated £4 billion, is the ultimate owner of CC Property Company and Consolidated Contractors International (UK). CCI (UK) is also a Tory donor, having given £8,500 in August last year. Antoine Mattar, a British accountant, is a director of both UK companies. He told The Daily Telegraph he had been introduced to David Cameron, but it was at a party “for four or five hundred people” at The Carlton Club in London, an elite gentlemen’s club for Conservative supporters. He denied that the company was created to funnel foreign money into the Tory party or that Mr Khoury gained access to Conservative ministers. He said Mr Khoury had never met Mr Cameron, “and if you asked him, he wouldn’t know who the [British] prime minister is”. Mr Mattar admitted that CC Property’s only income came from CCI (UK), the British arm of Mr Khoury’s construction group, which shares the same Knightsbridge address. Another director of both companies is Marwan Salloum, a Lebanese solicitor who was photographed on holiday with Saif Gaddafi in 2010, before the Libyan uprising. He was photographed sailing on a yacht off the Brazilian coast with Gaddafi and several bikini-clad women. As well as donating money to the Conservative Party, CC Property gave £17,076 to the Conservative Middle East Council last October. Meanwhile CCI (UK) actively lobbies MPs and has flown MPs from both main parties to countries where it has commercial interests. Bob Spink, the former Tory and UKIP MP, took three trips to Kazakhstan, between 2002 and 2004, partly funded by Consolidated Contractors International, which donated £3,000 towards his travel costs. John Mann, Labour MP and Secretary of British Kazakhstan All-Party Parliamentary Group, joined Mr Spink on the two of those visits and Linda Gilroy, former Labour MP, also went on two of the same trips. Both Fraser Kemp, the former Labour MP and Tim Loughton, a Tory, were given flights worth £1408 to and from Tajikistan in 2009. All of the donations and foreign trips were cleared by the Electoral Commission, which polices political donations.